I love this salad, it’s inexpensive to make, quick to put together (it takes awhile to set though) and everyone loves it. I’m not really sure that you should call it a salad, there’s no fruit in it, let’s just call it a “side”. The fun thing about this side dish is that it separates and looks like you’ve spent a lot of time working on layers. In reality, it just makes the layers all by itself. Mix Jell-O and water until Jell-O is dissolved. 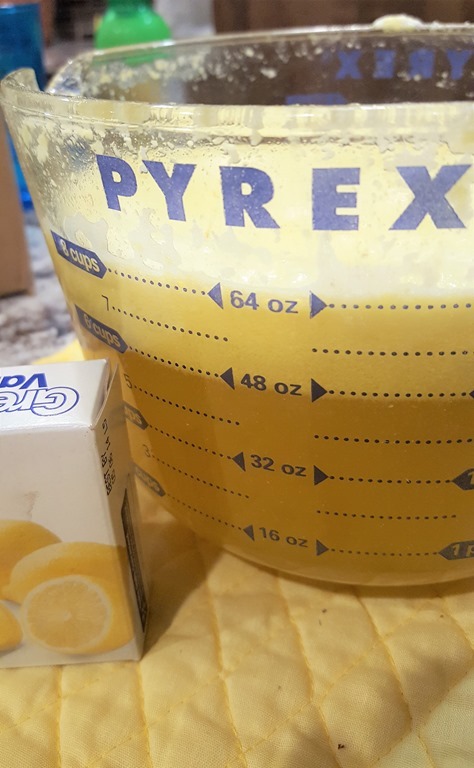 Add lemonade and stir. Refrigerate until syrupy. 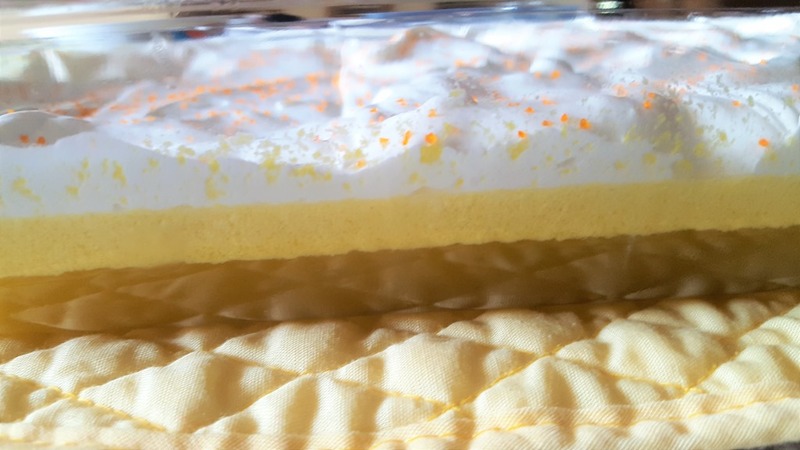 Fold in the whipped topping to the Jell-O and pour into a clear glass dish (I used a 10 x 15 Pyrex glass dish) and refrigerate until firm. In the above photo you can see the layers beginning to form even as I’m folding in the whipped topping. 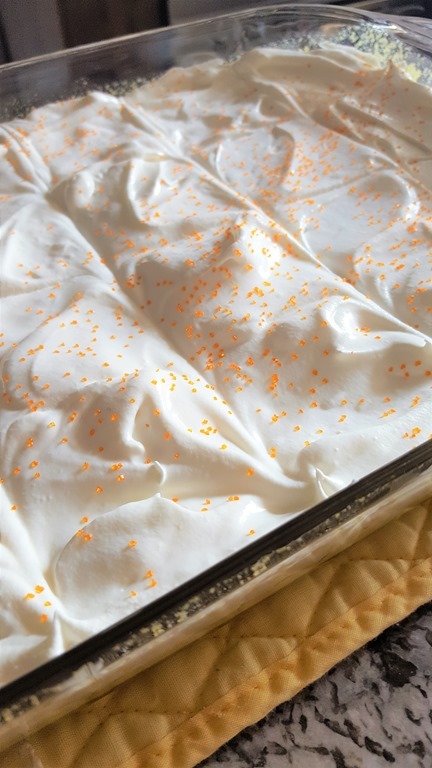 Spread a top layer for whipped topping over the Jell-O when set. 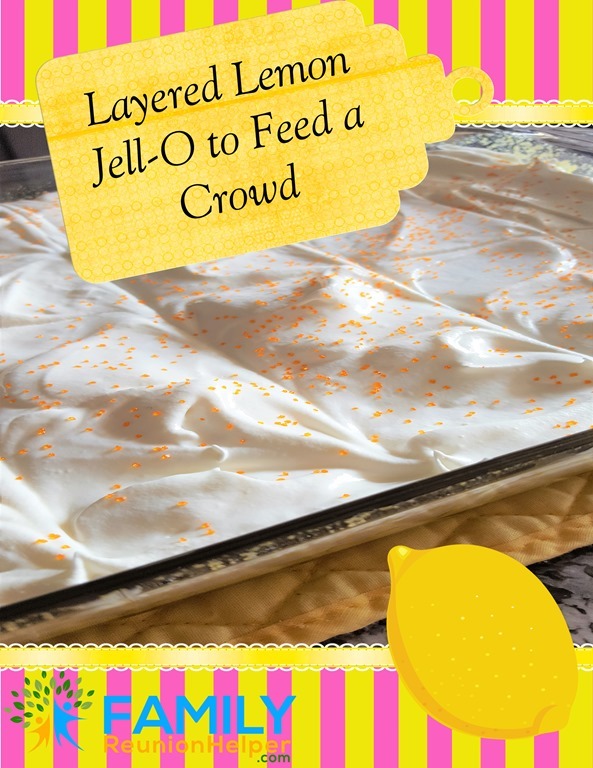 You change this recipe up to make it a fun side dish for using orange Jell-O with a can of orange juice and serving at your Halloween or Autumn gathering. I’m not a great food photographer, I’m more of a, “I’ve got 80 people to feed how do I do that easily, inexpensively and deliciously” type of person. 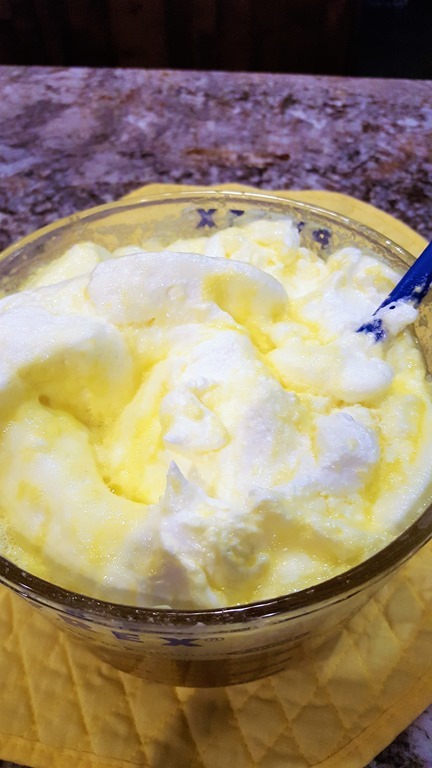 This lemon “side” is the answer for our family reunions and parties. As the family reunion chairman make sure you know about any food allergies or other food restrictions. As a family member with allergies be specific when you let the reunion food committee know about your allergies. Don’t just say “gluten-free crackers,” but suggest a brand and where to purchase it. No one is going to be as concerned about food allergies as you are. They may not consider some things that you feel are obvious so speak up. If you are planning a potluck meal for your family reunion make a note of food allergies in your family. For instance you could add, “Please remember, no nuts” (Be specific) on your invitation. 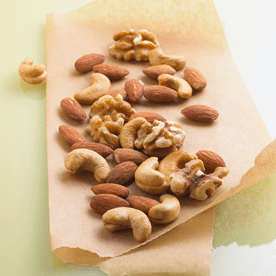 For some fun recipes check out these 10 Delicious Nut Allergy Friendly Recipes. 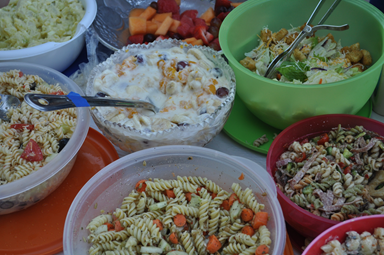 Some meal ideas that make dealing with food allergies at your family reunion a little easier is salad, taco or potato bars. Family members with allergies can take only those foods that are safe for them. See Aunt Mo’s blog on “Belly Up To The Bar” for more food bar ideas. However if the food allergy is life threatening you must be aware of cross-contact when eating at buffets or food bars. If you have food allergies, it is often safest to bring your own food. Instead of planning meals around the entire family consider doing some meals “on your own”. Offer to bring safe food so that you know there will be something there that you can eat. If you’re on the food committee consider keeping the original boxes and packages for food you’ve used so that parents can read the packages for themselves. Even though you may think you’ve taken all the precautions only those with experience will know for sure. If you are on the food committee for your family reunion don’t let those with allergies feel like a burden or annoyance. 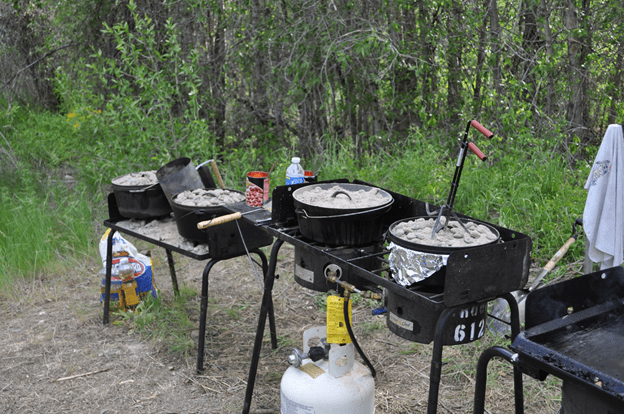 Let them know that you are want them to be safe and enjoy the reunion food just like everyone else. For help with planning food for a large reunion check out our “How Much Do I Need To Feed a Hundred” chart. Often food is given as prizes and treats at family reunions. Lisa suggests bringing your own bag of treats. Make sure the treats for those with allergies are “cool” treats like Pop Rocks or fruit snacks. Lisa also carries fast to fix food for her children like cereal, instant oatmeal, Cup of Noodles and instant mashed potatoes for when surprise situations arise. One of my nieces, McKell, is a vegetarian and we accommodate that at our family reunions by reserving a serving of Dutch oven potatoes before we add the bacon etc. She loves vegies and we always make sure there are several choices for her. McKell’s uncles like to tease her about her food choices but in the end they all respect her and work to make sure she can eat with the family. When it come to food allergies any food allergy can be life-threatening. As the Aunt to several children with food allergies, I try to be a meticulous label- reader and remove all nut- containing foods when I’m in charge of the food at a family reunion or party but honestly, I’m never going to be as good at identifying problem foods as Lisa or her children. Lisa has taught her children to accept some responsibility for the food they eat. They have learned to ask questions before they eat foods that may be a problem for them. And lets not forget those family members that may eating healthy or trying to lose a few pounds. Its such a welcome surprise for them when they find healthy options amidst all the high calorie foods usually found at a reunion. Check out our list of 30 healthy snacks all containing less than 70 calories for great snack ideas that won’t be detrimental to your health. A little extra planning can help those with allergies feel like they’re part of the group. If you can prepare one or two food items around your reunion theme. For instance, if you’re having “Bronasuraus Burgers for dinner make a vegie burger for you vegan family members. 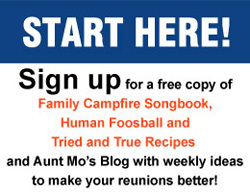 You will find some fun reunion reunion theme ideas here. Sometimes those with food allergies have apologized for being a problem and for the extra work it takes to accommodate them. Honestly, ensuring safety for family members is not being “accommodating”, it is being responsible and loving- and that’s what families do! My sister-in-law, Pam, brings the most delicious salads to our family reunions and parties but this salad, with pecans and pomegranate seeds, is my very favorite. 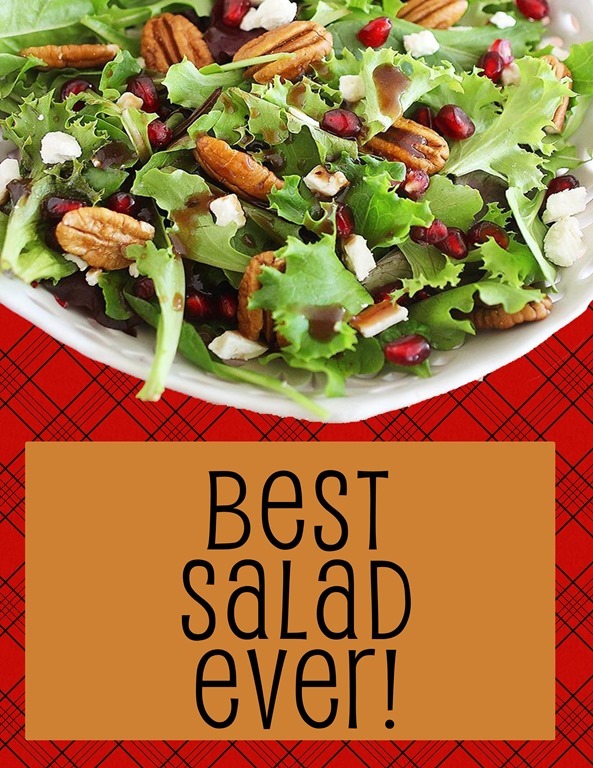 If you’re looking for a yummy salad to share at your next family gathering consider taking “The Best Salad Ever”! Combine mixed greens in a large salad bowl with pomegranate seeds, feta, pears and pecan halves. In a medium bowl, whisk vinegar with sugar, orange juice, dry salad dressing and vinegar. Whisk in olive oil or Canola oil gradually. Store in refrigerator until ready to serve then pour over greens and enjoy.